She has spent the last three season's with the Pembina Valley Female Hawks of the Manitoba Female Midget Hockey League, which included being league champions all three years. 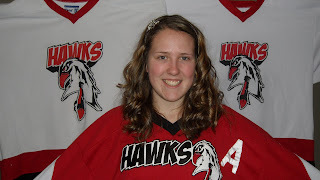 She has been the assistant captain for the past two seasons with the Hawks and has chipped in offensively with 23 goals and 38 assists in that time. She was also a member of the 2010 gold medal hockey team at the Manitoba Winter Games.